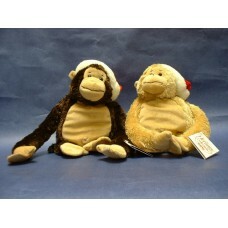 12.5" H.--Hang them as decorations or let the kids play with these "Hanging Monkeys"! "Velcro" on their hands makes it possible to hang them anywhere! (Hint: Remove their hats for year-round FUN!) Customers can choose either the Dark Brown or the Beige Monkey.